Singapore -- The historical Buddha was an incomparable leader in many aspects. Without any human weaknesses, he shone as a complete embodiment of virtue, an example of what we all can be. He led the monastic community with democracy, while teaching the world the importance of harmony and interdependence. With an open door policy, he welcomed anyone to challenge his thinking anytime. Being interested solely in the well-being of others, he was also an outspoken leader for human rights, animal rights and environmental rights. 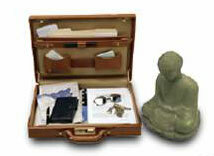 The leader of a team can be likened to a “Buddha”. He or she should oversee everyone’s work and welfare. He or she should be as compassionate and wise as possible, while constantly bettering oneself in these aspects. Being supposedly the most enlightened of the team, he or she has to be well-balanced in views, to always be fair and objective. The leader’s team members are like his or her protégés – future Buddhas. They are the Bodhisattvas – the Buddha’s helping hands, through which more beings are helped, and more work gets done. And those who the Bodhisattvas help, are of course all unenlightened beings - the beneficiaries of the team's efforts. All Buddhas train all Bodhisattvas to eventually become Buddhas, just as all Bodhisattvas train all beings to become Bodhisattvas. The Buddhas eventually enter final Nirvana, just as the Bodhisattvas will attain Nirvana, which is why the unenlightened beings should learn to take over their tasks in good time. This process of helping others and oneself to become more and more enlightened is dynamic spiritual evolution - never at a standstill. This is selfless skill development of all in terms of leadership training, the eventual enlightening of all beings. Spiritually, all Buddhas are the best leaders, capable ultimately, of leading us towards the ultimate goal of Enlightenment - which is why the Buddhas are called “Teachers of Humans and Gods”. They lead by perfect example and skilful advice, are never commandingly autocratic, but gentlemanly democratic, while being firm on crucial principles. Just as all Buddhas are blameless leaders, for all leaders to be blameless, they too should actively work towards perfecting themselves in terms of compassion and wisdom, so as to better inspire future leaders.